The Retail Business Technology Expo 2017 was the essential event for retail and hospitality organisations looking for the right tools, solutions, and advice on how to best run their business. This event was a one-stop shop, showcasing end-to-end solutions, from supply chain to the customer.Silver Touch Technologies Were delighted to participate in this great event. We showcased SAP Business One software for the retailer. We demonstrated a fully integrated solution, including a state of the art EPOS system to show the how they could run their business more efficiently and effectively. We had numerous discussions with the fellow partners, existing and potential clients alike, which was great tom hear their feedback on both the show and our solutions. 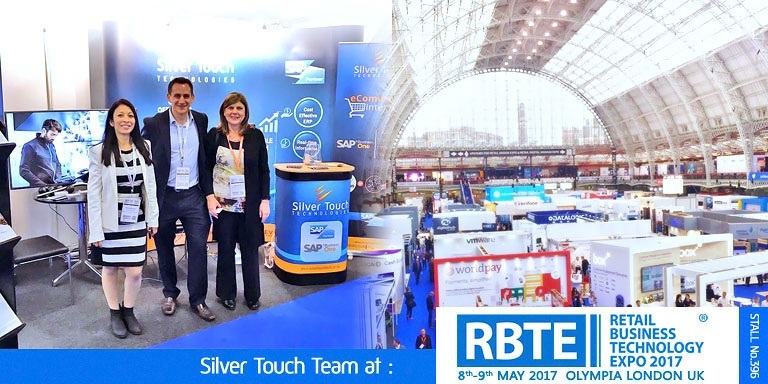 Silver Touch Technologies is the certified and trusted global SAP Business One partner specialising in ERP strategies, implementations and support. Our versatile solutions for SMEs and large enterprises with their small & medium sized subsidiaries includes core SAP Business One, specialised functional add-ons, integration to/from other systems, and country-specific add-ons (legal and local requirements). We have delivered over 90 successful implementations, building our reputation as a proven and trusted leader in the market accredited with prestigious awards. With operations in North America, India, Australia, France, and the UK, we have a solid base around the world and are strategically positioned to undertake global SAP rollouts.